What strange clouds these are, moving where there shouldn’t be winds, and forming where there’s barely any air. These are noctilucent clouds, sometimes called polar mesospheric clouds. Their icy strands form around particles at the top of the atmosphere some 80 km up. There’s almost no air up there so just how these clouds form has always been a mystery. They may be condensing around meteoric dust particles. They may also be more common now than in past decades and centuries, as the upper atmosphere cools due to an odd quirk of global warming that sees the lower troposphere warm while the upper mesosphere cools. This was the first display of NLCs I’ve seen so far this season. They can only be seen, and indeed they only form, in summer. Sunlight streams over the pole and lights these clouds all night long. They are literally “night-shining” clouds. Only from a latitude range of 45° to 60° north and around summer solstice is the geometry right to see the clouds, usually as electric blue cirrus strands moving slowly along the northern horizon. 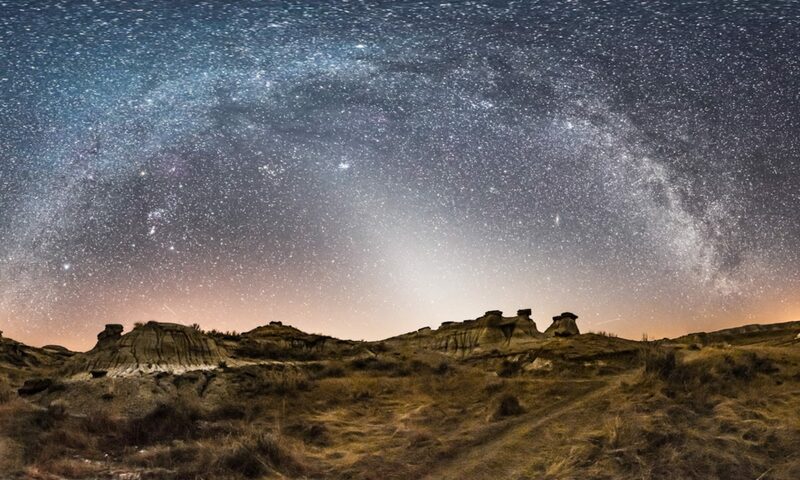 The time-lapse movies capture their motion over 30 to 90 minutes of shooting. 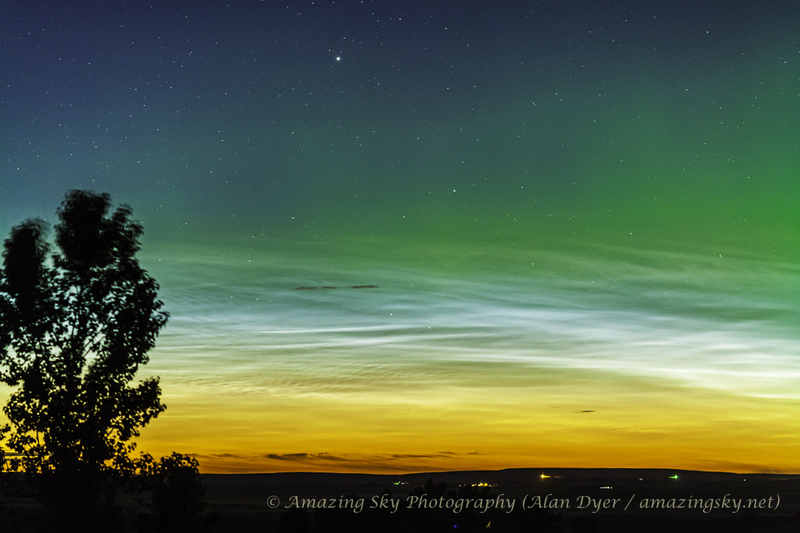 • The first, a wide-angle view of the amazing aurora that danced in fast accompaniment to the slow noctilucent clouds. • The second clip, very short, zooms in a little more to the northern horizon. However, I cut that sequence short so I could switch lenses and take the next clip. • The third scene is with a telephoto lens, framing the east-to-west slow motion of the clouds. I took 4-second exposures at 1-second intervals so it shows some pretty fine motion. This was certainly one of the best NLC displays I’d seen and my best shot at capturing them. What was especially rare was seeing them accompanied by auroral curtains actually moving among the clouds (or so it appeared). Both are up high in the near vacuum of near space, but they may have been miles apart in latitude.